“The best way to see Milledgeville… is by trolley.” Mary Ann Anderson explains during her travel of the Antebellum Trail in The Washington Post. We couldn’t agree more. 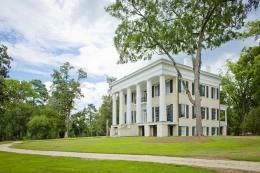 A guided drive through the landmark historic district beneath towering oaks and grand antebellum homes is picturesque. 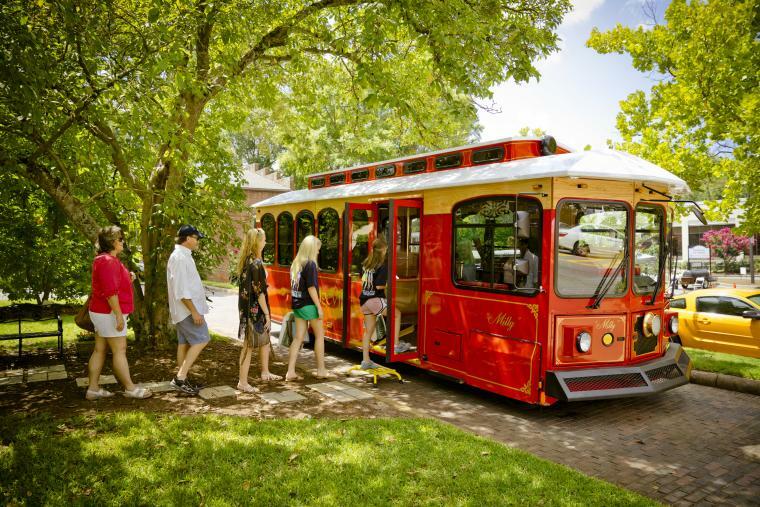 The trolley tour includes rotating excursions to visit the Old State Capitol, St. Stephen’s Episcopal Church, Rose Hill and the Brown-Stetson-Sanford House. Milledgeville was founded in 1803 around a series of beautiful squares and wide streets, the new Georgia capital city was carefully planned with designs elements from Savannah and Washington, D.C. 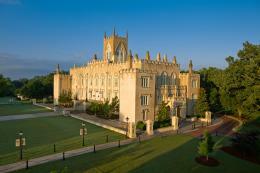 In 1805, The Old Capitol Building became the first public building ever designed in the Gothic Revival style. Today it is the oldest public building of its type in the United States. Trolley visitors tour where the state’s Secession Convention was hosted in early 1861 and it was here that the delegates voted in favor of seceding from the Union on January 19, 1861. Visitors must be sure to plan a return trip in the afternoon to visit the Old Capitol Museum, this regional museum interprets, preserves, and communicates the historical and cultural heritage of the Milledgeville – Baldwin County and broader Middle Georgia areas. Open Monday and Tuesday by Appointment Only, Wed. – Fri., 10 a.m. until 3:30 p.m., Sat., 12 p.m. until 3:30 p.m. and closed Sundays & Holidays. Admission: Adults: $6, Seniors $5, Children 6 & above and Students with id: $3. In 1841 St. Stephen’s Episcopal Church was incorporated by the state of Georgia and is the eighth oldest Episcopal Church in the state. The structure is the oldest church building in Milledgeville. During the occupation by General Sherman’s forces, soldiers from the 107th New York Infantry Regiment took shelter in St. Stephen’s. They not only burned pews for firewood but also poured syrup into the pipes of St. Stephen’s organ. When the nearby magazine and arsenal were blown up as the troops left on their famous March to the Sea, the roof was damaged and the windows were blow out. Originally built in the Carpenter Gothic style, St. Stephen’s Episcopal Church survived the damage. The original flat roof destroyed in the explosion was replaced with the Georgian style roof and narthex (the main entrance), but the building itself was saved and repaired. The stained glass window over the altar was a gift of Christ Church, Savannah, in appreciation for hospitality extended during the Civil War years. 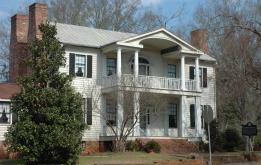 Built in 1825, the Brown-Stetson-Sanford House is a Milledgeville Federal-style house, owned and operated by Georgia’s Old Capital Museum Society. Located on North Wilkinson Street, it was built for George T. Brown by English-born builder-architect John Marlor. An architectural gem with its characteristic columned double porch, it served the state capital as the Beecher-Brown Hotel and then the State’s Rights Hotel for the many visiting legislators who came to the area. Don’t miss the spiral staircase which is a Marlor trademark. Ready to ride? 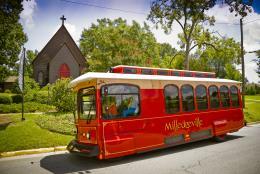 The trolley tour is available Monday – Friday at 10 AM and on Saturday at 11 AM. All tours begin at the Convention & Visitors Bureau. Admission: $12 Adults, $10 Seniors; $5 ages 6-13. ← Raising the Curtain on Milledgeville Theater!